Based in Ross-on-Wye, we are a dedicated and CHA accredited hydrotherapy centre for dogs. It is the goal of our veterinary team to provide hydrotherapy rehabilitation for surgical and injured patients. To monitor progress and achieve the best possible outcomes using our outstanding facilities. Physical rehabilitation has a significant role in the recovery regime for our patients and for certain conditions can be of benefit without the need for surgery. As dog owners we know that you look for the best recovery in the shortest possible time. With hydrotherapy this can be achieved. Not only that, you and your dog will thoroughly enjoy it. We are very proud to announce that we able to offer our patients Therapeutic Laser Therapy. Please read on and watch our videos to see how we are using this amazing treatment to help our patients. We are very proud of our a hydrotherapy centre. It is important to us that we provide the best treatment and care of all the dogs we see. We continue to invest in the equipment and the staff development in order to be a top class hydrotherapy and rehabilitation centre. Its superb, we love it and so do our dogs!! 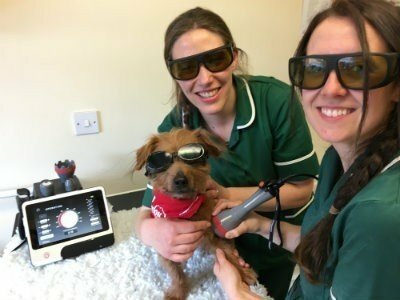 Here at Chaseview we are very excited to be able to offer our patients Therapeutic Laser Therapy. Please ask your vet to complete this form in advance of your appointment. The form can be emailed directly from this website or faxed.